If your future includes a move anywhere in California, check out Meathead Movers! Our professionally-trained student-athlete Oakland movers, moving concierge, and Princess Packers will get you safely moved into your new home. Welcome to Meathead Movers of Oakland! As one of northern California’s largest cities, there is an endless array of activities in Oakland. With a variety of world-class attractions there is always something to keep you and the family busy. Which is why our Oakland movers are here to help, no matter where you are moving in California. Check out pro-sports games, concerts at the Oakland Coliseum, bustling bars and clubs, world-class restaurants, a giant zoo, beautiful museums, and so much more. If you prefer a more natural element, take a stroll along Oakland’s vibrant waterfront or walk through any one of the abundant parks and open spaces and admire the oak trees that make Oakland famous. The city is a melting pot of people from all over the world. Its hip art scene, diverse population, and neighborly environment make Oakland a welcoming place to call home. If you are considering moving to this bustling city, Meathead Movers is here to help. Our moving company specializes in local, long distance, and commercial moves to, from, and within the Western United States. Our Oakland movers also provide reliable packing, storage, on-site relocations, and our distinctive concierge service. All our student-athlete Oakland movers are thoroughly screened and trained before their very first move. With branches throughout California, we are your one-stop resource for all your moving needs. In fact, see what your neighbors have to say about us. With our 100% satisfaction guarantee, the only thing you have to lose is the stress that comes from moving! 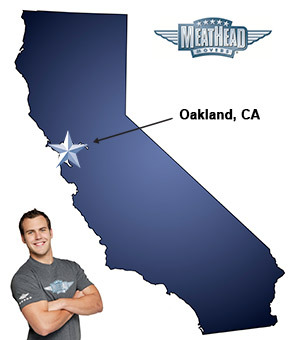 Contact Meathead Movers today for a free moving quote and learn how our Oakland movers can help you on your next move! Moving to Oakland? Here are some helpful resources. CAIDEN AND HENRY WERE ON TIME, PROFESSIONAL, FAST AND COURTEOUS. AWESOME MOVE!